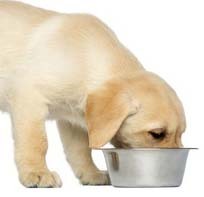 When I was growing up a family dog had two bowls. One for food. One for water. Into the food bowl went some kind of dry food that I dredged out of a large bag or a can of wet food that I kept at arms length as it squished and plopped into the bowl. Then I'd fill up the water bowl straight from the tap. Now I know that times have changed. There are many dogs that get pampered, whether it be by having a personalized food bowl, or being hand fed gourmet food by an actual chef - I kid. I'm also sure many canines out there are getting bottled water, electrolyte enhanced water, or in the very least filtered water. And all of this brings me to my point. I feel like a dog. Not a modern day pampered dog, but one of the ones I grew up with. I eat the majority of my meals from a single metal bowl and enjoy most of my beverages (typically tap water) from the same large plastic cup, both items purchased at my local HEB. I'm positive that I clean my food bowl much more regularly than I cleaned my dog's food bowl growing up, but the water cup, well that's a different story. You know how it is. I finish my water, rinse the cup out, then stick it on the counter for future use. I'm not sure when it is that I not only started eating most of my meals out of a bowl, but the same one. Regardless, this is a disturbing trend. Even more disturbing, perhaps, is that I have no intention of changing my ways. Until I make a meal that won't benefit from the cool comfort of my large (but not too large) metal bowl, my plates and other bowls will remain in their cabinet, used only in preparation of meals. My water bowl (cup) will get washed about once a month and the nice glasses I own will be reserved for guests and bourbon.